There’s no denying its extravagance, nor the pleasure and pride you get from preparing and eating it at home. 1. Heat 1 tbsp butter in a saucepan. Once foaming, add the shallots and bunch of tarragon; fry over a medium heat for 3-4 minutes, until starting to soften. Pour in the stock and boil for 10-12 minutes, until reduced to 2-3 tbsp. 2. Meanwhile, make the white sauce. Heat 1 tbsp butter in another pan set over a medium heat and, once foaming, stir in the flour. Cook for 1-2 minutes, until lightly golden. Take off the heat and gradually add the milk, stirring after each addition until smooth. Return to a low-medium heat, stirring, for 5-7 minutes, until you have a thick sauce. 3. Strain the reduced fish stock into the sauce, add the cream and season. Cook for 3-4 minutes more, stirring until thickened again. Transfer to a bowl, cool for a few minutes, then stir in the egg yolks, nutmeg and mustard. Cover the surface with cling film and set aside. 4. Prepare the lobsters (see page 89 for our step-by-step guide) and chop the claw and tail meat. Heat the final 1 tbsp butter in a frying pan set over a high heat. Once foaming, stir in the lobster meat, any juices and the roe and green tomalley, if using. Fry for a few minutes, then splash in the brandy and boil or flambé until the alcohol has evaporated. Set aside to cool for a few minutes. Pick and chop the leaves from the 6 tarragon sprigs, then stir into the white sauce with the lobster. 5. Divide the mixture between the lobster shells and place on a baking tray (cover with cling film and chill if making ahead, up to 24 hours in advance). 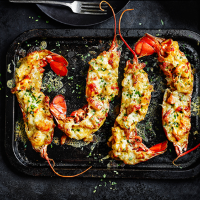 To serve, preheat the grill to high and scatter the cheese over the prepared lobsters. Grill for 4-5 minutes, until piping hot and golden.